The workshops started in 2009, following a donation from the Belly Dancing Association in Queensland. 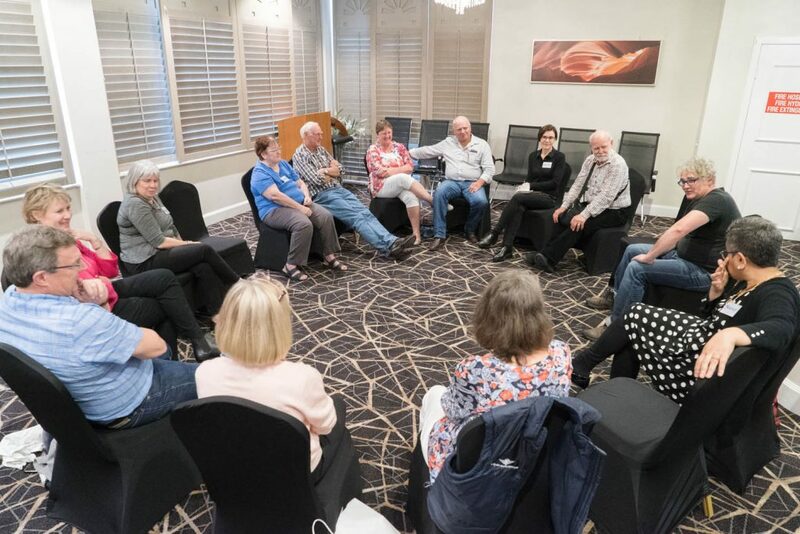 We discussed with the women in the group what we might do with the money, and one woman, who lived in Mackay, suggested a get together, so we could all meet one another. Since then we have had these workshops each year, and of recent times twice a year. We invite all the women in the group, and invite them to bring those people who are important to them – husbands and partners, adult children, mothers, other family members and friends. We cover all their travel and accommodation costs. The day is focused on being able to meet and speak together. The format includes 2 Q&A sessions with relevant professionals in the field, followed by a creative session after lunch. The day is enjoyable, informative and fun. A main feature of the day is the time and space it provides for people to meet and talk together. We have found that it has become a valuable day for family and friends to meet one another and talk about how the disease impacts them, as well as their wife, mother or daughter. To view information and photos from the last two workshops click here, and to see photos from workshops that are dated earlier than that, click here. Keep a spreadsheet of all costs. Include service dates, invoice numbers etc. Ring Centrelink and make an appointment to find out what benefits you are entitled to, e.g. disability support pension, carer’s allowance, carer’s payment. Ring your superannuation board and discuss whether you are entitled to a payout, and what may be involved in accessing your money.